Swing Clear Offset Door Hinges widen doorways for easier walker and wheelchair access, swinging the door completely clear of the opening. Narrow doorways can be a real handicap for someone using a wheelchair or walker. Residential building codes, architects and home builders haven't considered the needs of people using a wheelchair or walker. Doors can be widened but it can be an inconvenience and costly. An alternative solution might be replacing your existing 1-1/2" x 3-1/2" hinges with the expandable offset door hinge. These special hinges are designed to swing the door clear of the opening adding about 2" additional clearance for wheelchairs and walkers. These swing clear offset door hinges will replace your existing 1-1/2" x 3-1/2" standard interior door hinge, quick and easy to install and uses the existing holes and screws. 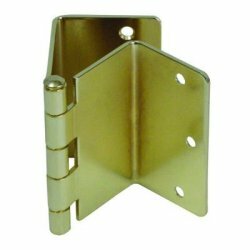 The hinge measures 2" x 3-1/2" (2" wide to wrap the trim, see top view) with a brass finish. Note: Count your door hinges before ordering. Although most interior doors use 2 hinges, some doors require 3 hinges. See the top view. The hinges wrap around your door trim. 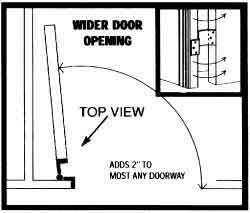 You need at least 3" between the inside of the door jam and adjoining wall for the hinges to fit. Provides barrier-free access by adding 2" additional clearance to most doors. Ideal for narrow residential doors. Easily installed, uses same screws and holes. 3 holes hinge measures 2" x 3-1/2". Replaces the standard 1-1/2" x 3-1/2" hinge. The ADA requires a minimum clear opening of 32". These hinges can make a standard 32" door ADA compliant in about 30 minutes! 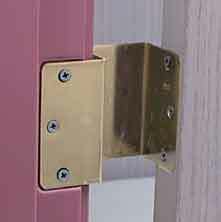 Note: The offset hinge can be used in both left and right hand doors simply by removing and reversing the hinge pins. The corners radius of the offset hinges may be sharper than your existing hinge and could require just a little trimming of the mortise with a utility knife and chisel. Remove existing hinges from the door jam and door. Save all screws. Attach the offset hinge to the door, counter sunk holes facing you. Use the same screws just removed in step 1 and screw into existing holes. Repeat this step to attach the second or third offset hinge. Attach the other side of the offset hinge to the door jam (counter sunk holes facing you). Use the same screws just removed in step 1 and screw into existing holes. Repeat this step to attach the second or third offset hinge. Tips: It can be easier to install the offset hinges by pulling the hinge pins and then installing the separated hinge halves to the door and jam. Set the door in the opening and reinsert the hinge pins. You can gain an additional 1" of clearance by removing the lower portion of the door stops from the jam.